Based on the popular Raiden battle-droid, the Belgdor is a slightly more mobile variant with a formidable homing missile system. The Belgdor doesn't have the one-punch knock-out capability of a Dorkas or Raiden, but it beats them both in speed and jumping range. According to the Virtual On manual, Belgdor is based on Raiden, which I would agree they have similar attributes. Belgdor's weapons aren't the most powerful in the game, but his mix of speed and power makes him weaker, but more agile than the Raiden. Belgdor's three basic weapons are Napalm, Grenades, and homing missiles. Belgdor's Napalm is not too powerful, but can attack through obstacles, and follows your target, plus a good distance. It can be used to drown an enemy out from behind and object, making it a good target for homing missles. The Belgdor is equipped with a grenade launcher, which is unfortunately mostly useless unless you want to keep your enemy on its toes in order to perform a strategy. They are however, rapid fire, but weak. Enough blasts at long range can cause a significant amount of damage, and if not that, it will definitely be an annoyance to your enemy. These are Belgdor's most useful items. They are good for both close and far range attack, however, be advised using this at close range has to be done at a certain time. The missiles are fast moving, but they are released slow, which is one weak spot any experienced opponent will take advantage of. The launchers are placed on Belgdor's shoulders, which is yet another advantage - Belgdor's height. 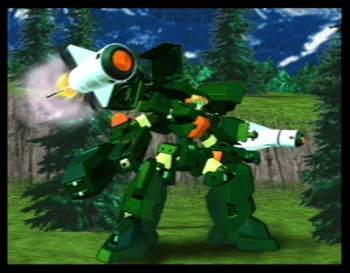 The altitude of his missile attacks are high enough to fire over most close range obstacles, making it easier to hide and still get at your opponent. Belgdor's only real useful crouch attack is it's homing missiles. Belgdor will lie back and fire his missiles into the air, causing them to go over obstacles, and even get a better hit rate, because shooting them upwards will help them turn better because of their distance from the enemy. Belgdor's best defenses are more in his speed than in his weapons. This VR is more maneuverable than Raiden, but not too quick, so the dancing strategy can be used to avoid, small, fast, long-range attacks such as missiles or laser shots. It's handling is not as reliable though, so you may want to stay hidden until you are ready to use any weapons, or charge at your enemy. To use weapons for defense isn't recommended for Belgdor. To keep your enemy away, it's good to use your Napalm or grenades to scatter your enemy away for a brief moment. Belgdor's weapons aren't powerful enough for a good close range defense. Belgdor, much like Raiden, was not meant for close range fighting. It's not armed with any fighting weapons or good close range attacks. Your best bet with Belgdor would be to get out of the enemies way whenever you are in danger of being hit by a close range attack, unless it's possible to execute a move.